I've really been focusing on improving my painting lately. New brushes, attention to detail and new techniques have really expanded my horizons. A while ago, there was a short series of articles on brushes and what makes a "good" brush. I used those posts to take a look at what I do and try my hand at something new when it comes to painting. I am fortunate that guys like John from Santa Cruz Warhammer and Justin from Secret Weapon Miniatures help me out when it comes to these things. As for the brush, I was hesitant at first to use it, but with a little practice it performs better than the thin bodied brushes. I like the springy feeling the brush has, you don't need much pressure since there is so much body behind the tip. I use the very tip when I paint but usually have the body filled with water (at least really damp) that way it seeps out as I paint. It makes the paint flow a little easier without thinning it out. The flow is much better and the tip has held it's shape so far and hasn't show any signs of wear yet. So far so good. The bristles are softer too so I can apply paint and not have to worry about it streaking on the model as the harder bristle brushes would do sometimes. Combining the right pressure with a good consistency of paint allows for some insane detail to be accomplished. I think to get the most of this brush, you really do need to understand a few things about painting. It will still work well for beginners, but in the hands of someone who knows how to use it, you can get results that are amazing. Overall, I'd say it's allowed me to move my painting forward substantially. My tabletop quality has improved along with being able to get it done quicker. My high end painting has stepped up too with the ability to really get in there and pull out the finest of details without trouble. So a big thank you for the article and getting me introduced to these brushes. I hate you for it. What's the point you ask? It's not that I use a new brush that is slightly more expensive, it's that the FTW Blogger Group has helped me improve my painting in ways that I never thought possible. On my own, I wouldn't have picked up a high-end brush and worked with it. I would have just kept doing what I do with the brushes I've always had... and never known any different. That's the beauty of the Group, being able to see so many different things that folks are doing and be able to ask them about it. To see something new, find out how to do and try it yourself can only help improve your modeling and painting. Things like using washes or applying weathering powders or even sculpting the simple things like purity seals... someone has done it and is willing to share what they've learned. For that, I am eternally grateful to those members who have posted and shared their tips and techniques. It helps all of us. I've got to completely echo your comment here mate. On the sculpting side, everything I've learned has been from the blogs belonging to the group and in turn, I've tried to share what I've learned in return. One thing I have noticed that really impressed me was the FTW tutorials section. It's been a while since I've looked at it, so when I checked it recently, I was astounded by how many tutorials are in there. It has to be the largest collection of 40k modelling tutorials on the web. So, thanks for pulling all this together for us mate. Thanks for posting this, Ron. This exchange of ideas, that started with your brush post and continued with my articles, really is what makes ++FTW++ my favorite community blog. There is real give-and-take, active commenters, continued discussion, revisiting of articles and ideas -- and then, of course, The Warp Report and the blogroll. This community has changed how I look at the hobby in many ways. Thank you for that! Col.: It might sound corny, but the tutorials section is the first place I go to look for how to do something if I haven't done it before. I figure someone already has and it will save me tons of work by checking out what they've already done. Even if it's to learn what not do because they made mistakes and have shared them (like trying to sculpt something a certain way or glue something together in a particular order, etc). It all helps. misterjustin: If you had just said, "Oh, great post, I use a different brush..." I would have never gotten what I did from your posts on brushes. And to think I knew what I was doing before. I appreciate all the honest comments and people that share what they've learned. I wouldn't be painting/sculpting the way I do today if it weren't for what people have shared with me on FTW. Awesome work on the models above, Ron... Are those unit markings on the knees done freehand? If so, that's incredibly impressive. Atreyu: Thanks, it's all freehand. 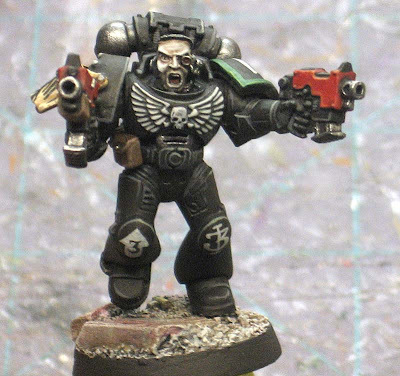 Forge World make Raven Guard chapter decals now if I'm not mistaken, but the stuff on his knees is done by hand.